It was a good idea in 1990. It’s still a good idea. Several early on decisions were especially important. 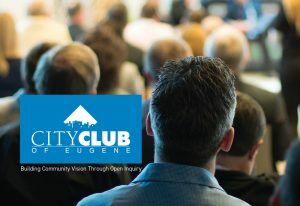 One, there was some sentiment that City Club should be under the Eugene Chamber. I and others opposed that because we felt strongly that we needed a place where people from throughout the community could gather and talk about the issues that affect us all. I’m glad that City Club remains an independent group. Second, we made an effort to elect presidents who represented various parts of our community during the first years. Today, we’d call that deliberate action – inclusion. Our firm developed City Club’s logo and came up with a tagline: Where minds come out to play. I loved that tagline, because sometimes we take ourselves too seriously. We need to engage with people who have different perspectives, listen openly and let the dialog develop. Who knows what we might discover? Engaged and playful minds – that’s how we build community vision through open inquiry. In keeping with the spirit of our founding, my hope for the future is that City Club would help people come together to learn and think about specific issues. That we could help build a shared community vision. One issue having a tremendous impact on our community right now is housing. Housing in our community is not affordable for many people. The statistics are astounding. Nearly half of local residents are cost-burdened and have to stretch their incomes simply to pay for housing and cover basic necessities. According to United Way’s ALICE report, some 42% of households in Eugene-Springfield are struggling to meet basic needs, with 18% of those in poverty and 24% earning more than the federal poverty level, but less than the basic cost of living. A more telling statistic is that the average local family spends more than 60% of their income on housing and transportation. When housing prices are high in a community, people are forced to seek housing in distant locations that increase their transportation costs. At the same time most of us would agree that we want to live within our urban growth boundary. We want to protect Oregon’s farms, forests and natural areas. Since SB 100 was passed in 1973, we’ve done just that. Yet, today throughout the state, there are pressures to expand UGBs. And, one of the main reasons is that people don’t want their single-family neighborhoods to change. Yet, if we don’t build more densely, we have no choice but to expand urban growth boundaries. Since SB 100 was passed, Oregon’s population has more than doubled (2 – 4.2 million). Yet, our land use laws have protected natural areas from being developed. Unfortunately, we can’t keep our sprawling neighborhoods and protect farms, forests and natural areas. So, what are the trade-offs? What are we willing to live with? What compromises will we make? How will we keep our communities livable, increase our supply of affordable housing, and protect the natural bounty of this treasure we call Oregon? That’s the discussion I hope City Club has, because I believe that City Club is a force to build community vision through open inquiry.